Over the past year, and more specifically the past few weeks, the sports world has been prevalent with athletes protesting during the anthem. Colin Kaepernick began his crusade by kneeling during the anthem in the 2016 NFL preseason, and continued to do so through the regular season. Kaepernick, who is currently not signed to a team, stated repeatedly that he knelt to bring attention to police brutality against African-Americans and racism in America. Kaepernick’s continuous presence and actions have brought controversy into sports. Both athletes and viewers either support Kaepernick’s protests or are strongly opposed, and believe that it is disrespecting the flag or those who have fought for America. And as these passionate opinions have trickled down to youth and college sports. As the 2016 season continued, others joined in the protest, from different sports and different teams. However, it was not until President Donald Trump posted in series of tweets chastising those who protested, that the cause really took flight. “The issue of kneeling has nothing to do with race. It is about respect for our Country, Flag and National Anthem. NFL must respect this!” Trump tweeted on Sept. 25. The following Sunday the majority of the NFL’s teams had at least one player protest in some manner. Despite the possible legalities, or lack thereof, of Trump calling for the termination of protesting players, it has brought attention to the subject and widened the pool of protesters. Major league sports are not the only grounds these demonstrations are taking place. Athletes across the country are showing their support, from high schoolers to college athletes. 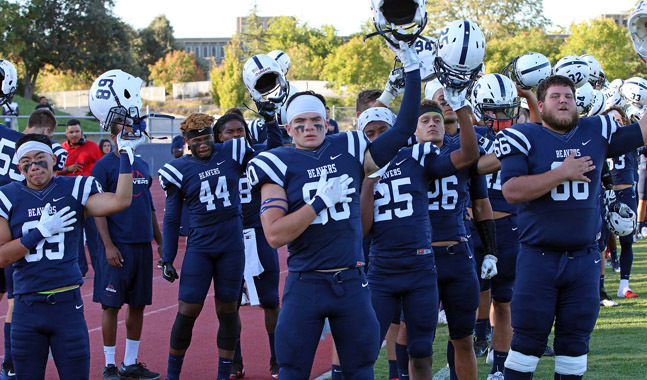 American River College Dean of Kinesiology and Athletics Derrick W. Booth, said in a statement to the Current, that American RIver College does not have any policy against students or staff members participating in the protest. “[W]e believe [protesting] is a constitutional right.” said Booth. The continual protests have been a divisive topic in this county. From stanch supporters hoping to bring awareness to the inequality in this country to those worried it is disrespecting those who have fought for this country. “The attempt to bring more attention to cases of police brutality and social injustice has been divisive and polarizing. It has certainly made many people uncomfortable.” said Booth. Although there is a great division in this country on the subject, Booth does not believe that the sides are incongruous. “In fact, the Los Rios District believes that the right to make a personal decision on issues like this is fundamentally what makes our country so great,” Booth said. It is the district policy that no person, be it student or faculty, should face repercussions for expressing their beliefs on this topic. This includes any peaceful protesting, before during or after the game. Most of the sports played at ARC begin with the anthem, except those that are not in hosted venue such as gyms or stadiums. “But I feel compelled in light of all the negative dialog to point out some of the great behavior and tremendous respect that I have seen in my short time in Athletics,” Booth said. Booth also recounted that on the occasion that he was at the stadium, watching a soccer game, he observed the football players on a separate field, pause what they were doing, remove their helmets, and shout at the end. “That was extremely classy and shows a great amount of respect.” Booth said. Although Booth said he does not know of any athletes that are currently participating in the protest it is his hope that should any student wish to join the protest, they will feel supported in doing so. It is also his hope that they will feel comfortable enough to start a dialogue with their coach and fellow teammates. “Sports has been a unifying experience in America. It was a place where people of different ethnicities, religion, orientation and political views all played side by side. All that mattered was talent. Hopefully, as a society we can move from positions of peaceful demonstrations to one of dialog and then change.” Booth said. Be the first to comment on "Kneeling during the anthem hasn’t found its way to ARC"